Hello everyone! It's time for another Stampin Sisters in Christ Challenge! Yay! We all enjoyed our break and hope you had a wonderful Christmas as well, but now we are back and ready to be challenged again! This week, our challenge hostess is my dear friend and DT sister, Chris Olsen. She has chosen Ruth 2:12 for this week's Scripture! "May the LORD repay you for what you have done. May you be richly rewarded by the LORD, the God of Israel, under whose wings you have come to take refuge." Chris is challenging us to use wings on our card or project. What a great challenge for the first one of 2011! I love the book of Ruth for many reasons. Ruth is truly a picture of unselfish devotion and love. Ruth was a Moabite woman and after the death of her husband was willing to leave her family, country, and even the idols of Moabite worship out of loyalty to her mother in law and to the God of Israel. She told Naomi that wherever Naomi went, she would go; that Naomi's people would become her own people... and that Naomi's God would become her own God. I love reading how the Lord protected Ruth and rewarded her as well! When you think of protection and safety... what do you think of? I love the word picture here...that God would gather Ruth under His wings, offering her the protection He gives to His own people much as a mother hen gathers her chicks under her wings and protects them from danger. Do you feel like there are storms raging around you? Do you long for safety? Well God offers that protection to His children! If you don't know Him personally, I urge you to come to Him as your Savior and Lord, and He will give you that protection. There is no safer place to be than sheltered by the Almighty! My project today was inspired by the Tissue Box I posted Thursday (one post down). I altered an acrylic tissue box with spring/summery images and verses that speak to my heart. I shared that I was starting to make panels for a winter and fall version of it, since it's easy to change out the panels. This is the first panel for a more wintertime cover. Please scroll down one post to see the full box in it's spring version. As you can see... when you insert the panel, you really don't have room for ribbons and bows, but you can still fit in a few layers! I used Our Daily Bread designs "Sing to the Lord" set for my image and verse. I love this verse too.... if God cares for the birds of the air...how much more can we be sure He will care for us, for we are precious to Him! My base is Gina K, as is the white card stock. I stamped with Memento and colored with Copics. I used Spellbinders Lacey Squares (I cut 2 and overlapped to make a rectangle) and Labels Ten, cutting them out with my new Grand Calibur! (Oh I love this machine! It cuts and embosses like a dream and so smooth and quiet!) To mat my verse I cut another Label 10, cut it in half and just slightly extended it over the ends for a shadow effect instead of using the next bigger size, as that was quite a bit bigger. We want to thank them for their continued support and generosity! Thanks so much for stopping by! If you have not entered my Blog Candy Drawing, please do so HERE! Have a blessed week! This is absolutely gorgeous Grace!! I just love your bright cardinal against that beautiful pinecone dp!! I need to make one of those tissue boxes now too! You and I were on the same track with the passage. Your words are so insightful and true. This is absolutely gorgeous, Grace! I love the background paper and the beautiful cardinal! Wonderful verse! Hey girl....I did not notice ODBD in your list of challenges. You know how much I appreciate your support. Just love you and your creation. Thanks for joining ODBD's Shining the Light challenge! Awesome - not surprising! You are so talented and I love everything you do! I will have to find one of those tissue boxes - or maybe more than 1. Fantastic! This is beautiful, I love the image. Thanks for joining us at the CES & Sweet Stampin Challenges! This is stunning Grace, just stunning. You are so right Grace, there is nothing like being under the wings of Christ. This is so pretty, I don't have that set and I think I need it!! Gorgeous, just love it hun! 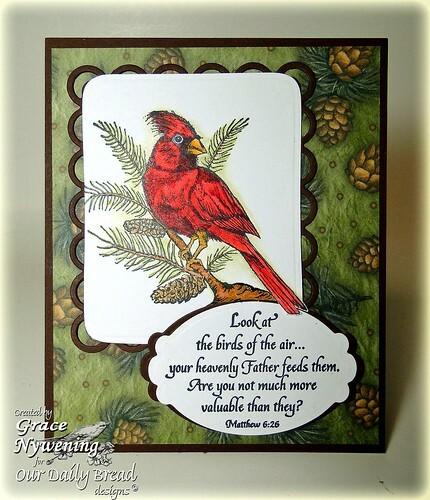 Beautiful card - I love your pretty cardinal and the pine cone DP behind it - lovely job and thanks for playing along with the OCC! This is gorgeous, Grace! You colored the bird so beautifully! Lovely card! Grace this bird is soooo beautiful and your coloring is GORGEOUS!! What a wonderful creation sweetie!!! Hope you are having a GREAT weekend! Very pretty!!! I love your cardinal and that DP is Gorgeous!Thanks for playing along with 'Our Creative Corner' this week!! A wonderful card Grace, beautifully coloured. this is a gorgeous card. I love those Cardinal birds. We don't have them here in Australia. you colored him beautifully. Love that design paper with the pine cones. and of course love the scripture. This is gorgeous Grace! And what a beautiful image, verse and creation. I always enjoy visiting your blog and am looking forward to many more visits this year. Beautiful card and beautiful scripture to use for a sentiment. :-) Thanks for joining our challenge at SS! BEAUTIFUL,Grace! I LOVE the word picture of Under His Wings! It evoked such protection, warmth, and love. Absolutely lovely, Grace. The cardinal is so beautifully colored and that DP is gorgeous. And the acrylic tissue box is fabulous too! This is a wonderful entry into the inspiration challenge. So happy that you were able to join in the fun with us this week at Our Creative Corner. Gorgeous project hun, love that image. A gorgeous card, just beautiful. Thank you for joining us at Rainbow Lady's challenge. What a gorgeous 'Grace' special. I LOVE birds and your cardinal out among the pinecones is absolutely beautiful. And, such a wonderful verse. It's all beautiful!!! Thanks for joining the Stampin B's old/new challenge this week. 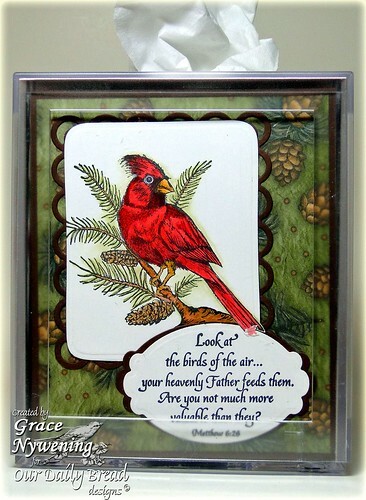 a fabulous card with an awesome image...love this bird-image...so delightful! What a great card, love the bright colours. This is so wonderful, Grace! I love that image and your colours! Gorgeous, love your papers, thanks for playing along with SSD! I have to stop by your blog at least once a week so I cn be AMAZED by our creations. They are always so beautiful. This is beautiful Grace. You picked the perfect papers. My cardinals were busy today with all this snow.. Hope to see you on Friday. Just beautiful, your shading and colors brought this bird and card to life. This is stunning Grace! Work creativity inspires me so much. Your words are so true! Ruth is a great example. I love what you wrote, and love what Christ shared on the SSIC site. This panel doesn't need buttons and bows. Not the way your color so beautifully. And, the bg paper is perfect for this image. This is one of my favorites, too. Beautiful project and colors...such a unique idea! Thank you for joining us this week at Catch the Bug! A pretty card. Lovely colors and cute image. Thank you for joining us at Catch the Bug Challenge blog for our Emboss it Challenge! Hope you will join us Saturday for our Birthday Blog hop! This is just gorgeous!! Beautiful work!! Thanks so much for playin' along with this weeks Catch The Bug "Emboss It" Challenge with Bugaboo Stamps! We hope you'll join us tomorrow for our BIG Birthday Blog Hop!! Aww, such a pretty card. Thanks for joining us this time at Craft Your Days Away. Good luck.